Iran's president has agreed in principle to accept Brazil as mediator on a deal for providing it with nuclear fuel, Fars news agency reports. The proposed UN-backed international deal to swap Iran's low enriched uranium for high-enriched nuclear fuel broke down earlier this year. The idea was to ensure Iran had nuclear fuel for medical purposes, while reducing its bomb-building potential. Iran denies international claims it is trying to develop atomic weapons. "In a telephone conversation with his Venezuelan counterpart, [President Mahmoud] Ahmadinejad agreed in principle to Brazil's mediation over the nuclear fuel deal," the semi-official news agency Fars reported. The deal was proposed by the US, Russia, China, UK, France and Germany. Under it Iran would be required to ship 1,200 kg (2,646 lb) of low-enriched uranium to Russia and France, where it would be converted into fuel to be used to make isotopes for cancer treatment. In January, diplomats said Iran had told the UN's nuclear watchdog, the International Atomic Energy Agency, that it did not accept the terms of the deal and had instead demanded a simultaneous exchange on its territory. But suggestions in recent months by Mr Ahmadinejad that he might be willing to re-enter talks on the deal have been met with scepticism among Western countries. Brazil's foreign minister is reported to have said during a visit to Tehran last week that his country would be interested in playing a role in settling the dispute over Iran's nuclear programme. But it is not clear whether a formal proposal has been made. Brazil's President Luiz Inacio Lula da Silva has said he opposes sanctions against Iran. Also on Wednesday, the Iranian president told ABC News Iran would "definitely continue" its nuclear program despite the potential threat of Israeli military action. He also brushed aside the current US push for a fresh round of sanctions. "This is not something that by threatening Iran or putting pressure on Iran will force Iran to change its positions," he told the US news channel. He is currently in the US attending a conference on the Nuclear Non-proliferation Treaty (NPT). US Secretary of State Hillary Clinton said on Monday that Iran's nuclear ambitions were putting the world at risk. 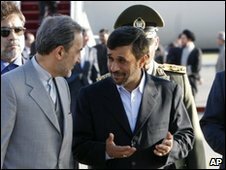 Mr Ahmadinejad had earlier accused states with nuclear weapons of threatening those who wanted to develop peaceful nuclear technology. His comments prompted delegates from the US, the UK and France to walk out.